The largest island is Crete in the Mediterranean Sea. 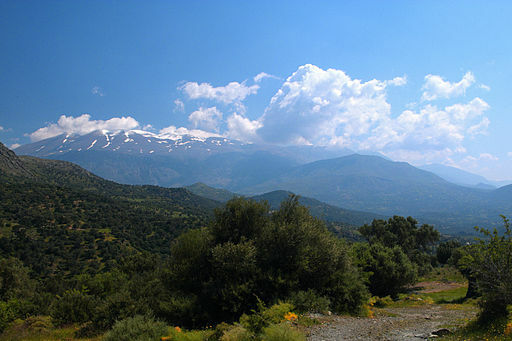 It is extremely mountainous and has a number of steep-sided gorges on it such as the famous gorge of Samaria. Nearly half of the 500,000 people that live on the island live in rural areas and work on farms. Dairy products are very popular, especially cheeses such as mizithra, anthotyros, and kefalotyri. Cretetans are very proud of their island and their customs - they: write their own Mantinada-style poems, play music on the lyre, enjoy dancing traditional dances and like wearing black clothes. There are no animals that are dangerous to humans on the island of Crete. Santorini is a popular tourist destination, even though it is considered to be an active volcano and there are poor water supplies because it has no rivers. Beach sand colour depends on the solidified lava in the area so there is: the Red Beach, the Black Beach, the White beach etc. The water at the darker coloured beaches is significantly warmer because the lava absorbs and keeps hold of heat. Due to its volcanic ash soil, Santorini is home to unique crops like: Santorini tomatoes, eggplants, cucumber and melon. There is also a fairly large wine making industry too. Most of the houses on the island are made of local stone and are whitewashed or limewashed with various volcanic ashes used as colours. Some have extensions dug into the surrounding rocks which stay cool in the hot, summer months. Greece has a troubled relationship with Turkey over the island of Cyprus, which has a large Greek population. Cyprus is divided into Greek and Turkish areas and is monitored by the United Nations to make sure that neither country starts a fight over the island. Ferries are the main mode of transport used to travel between the islands of Greece. The main port is at Pireaus, near Athens and there are daily ferry services to most islands. Some are fast catamarans with airplane-style seating on them, whilst others have cabins on for people to sleep in overnight, as well as restaurants and entertainment facilities onboard like a video games room or a swimming pool.